Every year my little cherry tomatoes are the first to show their vibrant colours in my garden. They don’t tend to make it into my kitchen very often because the kids and I eat them right off the vine. Fresh tomatoes from the garden are delicious and this recipe compliments their full flavour nicely. This recipe is a favourite for kids to make due to its easy assembly. 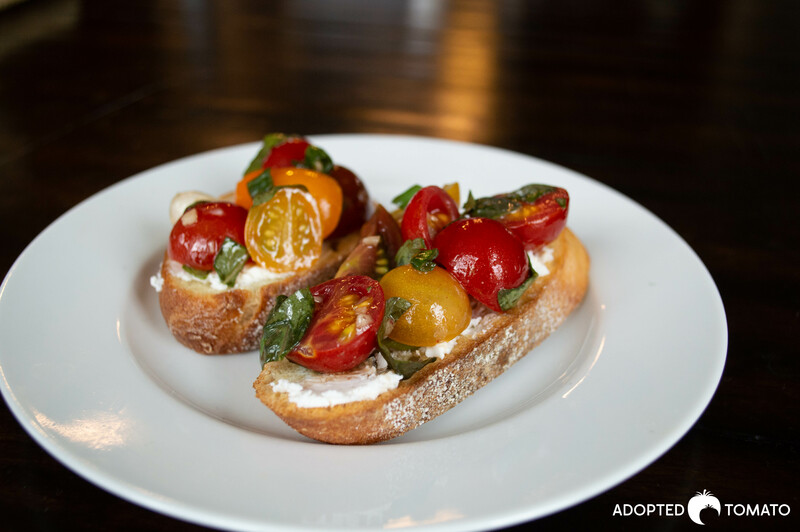 Serve this as an appetizer with fresh pasta and a glass of Rose’ on a hot summers day. Gather your fresh tomatoes from the garden. Wash with cold water and then cut each tomato in half or quarters. Put tomatoes in a small bowl. Add the minced garlic, basil, balsamic vinegar, olive oil, salt and pepper to the tomatoes, stir, cover, and place in the fridge over night. Take your baguette and slice into thin even slices about 1/2 inch thick. 8 slices in total. Brush them with olive oil and bake in a 400 degree oven for 3-5 minutes until slightly brown on the edges. Remove from oven and set aside. Spread the goats cheese evenly on each crostini. About 1/2 tsp on each one. Top with the marinated bruschetta mixture and serve. We tend to eat our cherry tomatoes right off the vine, too, or fill up bowls for snacking. 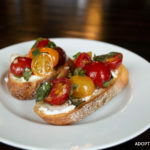 But this bruschetta is a perfect way to use some of them. It looks so pretty and fresh, and a perfect appy for summer entertaining! This is such a simple recipe, but it packs a ton of flavour! Thanks for sharing. It’s a great way to use up all those cherry tomatoes in season now.